Found in northern parts of the subcontinent, the sarus crane is India’s largest bird, the males sometimes measuring two metres high. Usually living in pairs, these cranes became proverbial in folklore for their conjugal fidelity. The emperor Jahangir (1605-1627) kept a pair, which he named after the legendary lovers Laila and Majnun. Shaikh Zain ud-Din’s half life-size depiction of this bird is still almost too large for the outsize sheet of English paper. While retaining the format and plain ground of a scientific study, it shows great assurance and sensitivity in its elegantly flowing outline and finely painted plumage. With the decline of the Mughal nobility in the later 18th century, many artist at the courts of the eastern India and elsewhere began to turn for patronage to the new British ruling class. Much of the enormous output of these “Company” painters [see EA1966.232] consists of standardised series of illustrations of native castes and professions, festivals and monuments, which are sometimes little more than a superior form of tourist art. In a few cases, however, painters of real distinction formed a productive relationship with individual British patrons. One early example of this is Shaikh Zain ud-Dīn, who was employed for several years as a bird and animals artist by Mary, Lady Impey, wife of the first Chief Justice at Fort Williams, Sir Elijah Impey. The Impeys had arrived in Calcutta in 1774 and soon came to share the fascination with India and the scientific curiosity about life and its culture which prevailed among members of the circle of Warren Hastings. 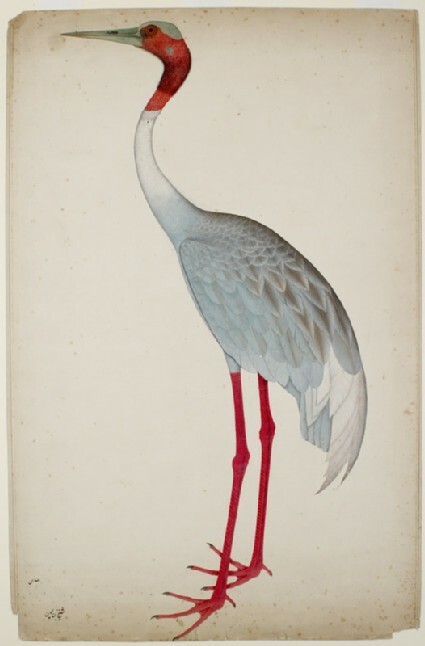 While Sir Elijah collected Oriental manuscripts and paintings, Lady Impey formed a large menagerie of birds and animals, including some exotic specimens brought from further East. A series of meticulous studies of these living models, in most cases life-sized, was made by three artists in her employ. The most skilful and prolific of these was Shaikh Zain ud-Dīn; his two Hindu colleagues, Bhawānī Dās and Rām Dās, were responsible for less than a quarter of the known paintings. All three are described in the clerk’s inspection which appear on many of the pages as “native of Patna”, and it is likely that they had originally been trained there in the current Provincial Mughal style of painting. But even in the earliest paintings from the series (dated 1777) Zaid ud-Dīn shows complete assurance in adapting to the conventions of British natural history painting and the unfamiliar large format of the imported Whatman paper, whilst retaining much of the vitality of characterisation of the Indian tradition. This probably somewhat later study of a Sarus crane is remarkable for the fine delineation and subtle colouring of the bird’s grey and brown plumage and its head and spindly crimson legs. Work on a series ended prematurely when Sir Elijah was recalled to England in 1783, and in 1810, following his death, the collection was dispersed at auction in London. 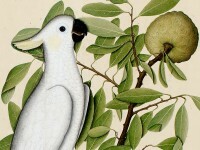 Of more than two hundred paintings in the series, about 120 are now known to survive, most of them bird studies. A group of eighteen of these is on loan to the Museum from the Radcliffe Science Library, Oxford, to which they were given in the 19th century by Sir Henry Acland. Fourteen of the pictures are by Zain ud-Dīn, three by Rām Dās and one by Bhawānī Dās.